The Superman Fan Podcast: Episode #228: Superman Comic Books Cover Dated November 1960: Superman #141 & Action Comics #270! 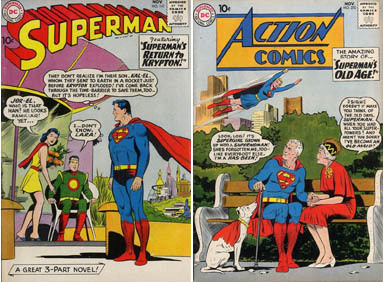 Episode #228: Superman Comic Books Cover Dated November 1960: Superman #141 & Action Comics #270! Superman #141 & Action Comics #270! SUPERMAN 141, November 1960, was published around September 15, 1960. It contained 32 pages for a dime. Mort Weisinger was the editor, and the cover was pencilled by Curt Swan and inked by Stan Kaye. SUPERMAN'S RETURN TO KRYPTON (A GREAT 3-PART NOVEL) was written by Jerry Siegel, pencilled by Wayne Boring and inked by Stan Kaye. It was reprinted in SUPERMAN IN THE SIXTIES, SUPERMAN: THE GREATEST STORIES EVER TOLD vol. II and SHOWCASE PRESENTS: SUPERMAN vol. II. This was Siegel's 19th silver age Superman story, and 47th overall during this era. Previously, he wrote THE DUEL FOR EARTH for ADVENTURE COMICS 277, October 1960, his 28th silver age Superman Family story. If you're interested in listening to another podcaster and Superman fan discuss this story, listen to Scott Gardner, host of the TWO TRUE FREAKS PODCAST, in his episode, BACK TO THE BINS PRESENTS: I'VE GOT A FEW THINGS TO SAY ABOUT SUPERMAN - EPISODE 3! ACTION COMICS 270, November 1960, was published on September 29, 1960, two days after I was born. It contained 32 pages for the cover price of 10¢. Mort Weisinger was the editor, and the cover was pencilled by Curt Swan and inked by Stan Kaye. The 10 page Superman story was titled THE OLD MAN OF METROPOLIS (called SUPERMAN'S OLD AGE on the cover), written by Otto Binder, pencilled by Curt Swan and inked by John Forte. It was reprinted in 80 PAGE GIANT 1, SHOWCASE PRESENTS: SUPERMAN vol. II and SHOWCASE PRESENTS: SUPERGIRL vol. I.
Supergirl starred in the 13 page story, SUPERGIRL'S BUSIEST DAY, written by Jerry Siegel and drawn by Jim Mooney. It was reprinted in SUPERGIRL ARCHIVES vol. II and SHOWCASE PRESENTS: SUPERGIRL vol. I. This was his 29th silver age Superman Family story. To hear to me discuss all of the Superman titles which were published on the month I was born, listen to EPISODE 148: IT WAS 50 YEARS AGO TODAY! Elsewhere in DC Comics, 29 titles carried the November or November/December 1960 cover dates. Next Episode: SUPERMAN FAMILY COMIC BOOK COVER DATED NOVEMBER/DECEMBER 1957: WORLD'S FINEST COMICS 91! In 2 Weeks SUPERMAN COMIC BOOK COVER DATED DECEMBER 1960: ACTION COMICS 271! Check out SLIPSTREAM, the weekly web comic book I'm drawing and lettering, which is written by Jeffrey Taylor, co-host of the FROM CRISIS TO CRISIS PODCAST and contributor to the SUPERMAN HOMEPAGE. New pages of SLIPSTREAM can be found each Saturday at http://www.clockworkcomics.co.uk. Adam Dechanel, another contributor to the SUPERMAN HOMEPAGE, also writes and draws E. O. S. for Clockwork Comics, and new pages are available on Tuesdays and Thursdays.